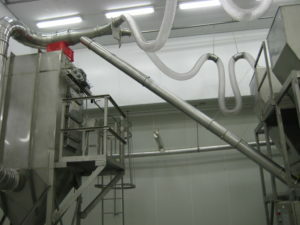 Batching ingredients for food processing applications is a common requirement. To do this effectively the ingredient batching must be done accurately and with high throughput for maximum profitability. 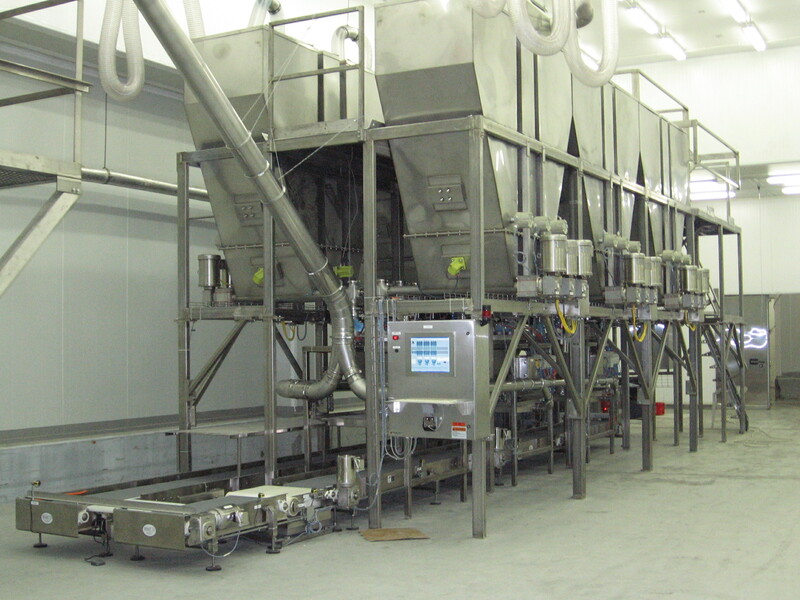 A minor ingredient system for foods is the ideal process equipment item for the modern food processing factory. In one such application a minor ingredient system for foods consists of 18 bins, 3 sc ales and many advanced features that make the system truly remarkable. In this application a variety of ingredients were being added into traveling totes in predetermined specific formulas. Three scales were integrated into the micro ingredient system for foods. Each weigh scale has multiple ingredient inlets and dust collection take offs on the scale hood. The minor ingredient system was provided with a dust collector, dust collection hoods for all weigh scales and dust traveling hoods to cover all bins when filling each bin. 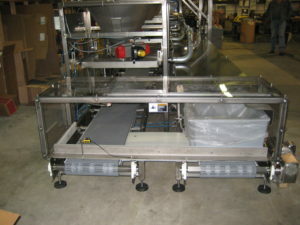 All stainless steel construction, this minor ingredient batching system is truly made for food processing applications. Every Sterling Systems minor ingredient batching system is custom designed, engineered and manufactured for the customer’s specific needs and goals. 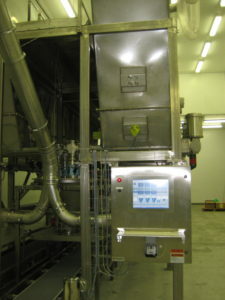 This minor ingredient system also included fully solid-state capacitance type level controls, pneumatic vibrators, and flexible ducting for the dust collection system. The operator selects the desired formula to be batched along with the desired number of batches of that formula using the keypad. Once the operator verifies the formula requirements are correct, he places the tub(s) with liners on the empty indexing conveyor. 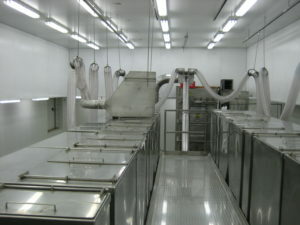 Once tubs with liners are staged and the system is started, the system will index an empty tub to the scales. Tubs will not index until there are empty tubs in position to be indexed eliminating empty scaling positions and losing batching time. The controls will automatically start each feeder in turn. 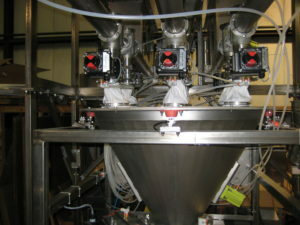 Each feeder has computer controlled two-speed control (fast fill, slow dribble) for high accuracy transfer amounts. After the desired ingredients are discharged from the scale hoppers, the tubs will be indexed to the gravity conveyor or unload position. The system will continue this sequence. For increased throughput, the system will simultaneously weigh into each of the three (3) scale hoppers – one ingredient per scale at a time. Once the tubs have completed collecting ingredients at each of the scale hoppers, the tubs are conveyed to the exit gravity conveyor. The minor ingredient control system provides real time records for each batch produced, enabling the highest standards to be maintained by ensuring a consistent product. As batches are produced, the system records the batch data to the database and can print batch reports to an office printer. The report provides each ingredient by identification along with the required and the actual formula weights. A time and date is also stamped on each report at the start and end of the batch. If an alarm condition occurs during batch processing, the system will print an alarm mess age enabling a supervisor to review the performance of the operator and track problems that may occur later. The entire system is controlled using the exclusive Sterling Systems & Controls Windows Batching Software custom engineered for this specific customer requirements and goals. The software makes creating new formulas and scheduling batches easy. Using standard windows based commands and icons, a Supervisor can complete complex tasks with ease. The software ensures that batch throughput is maximized and all batches meet their specifications. Real time batch reports are produced with every batch. These typically show the ingredient desired and actual amounts along with batch start and end times. In addition, this information is stored to the computer’s hard drive in the system’s database. From here, this information can easily be reviewed with easy access to Production Information, Ingredient Inventory, Ingredient Usage, Alarm Conditions, and General System Information. This information can also be exported to most business software eliminating the need for re-entering data. Dust control and containment inside the plant was a big concern and a requirement. Sterling Systems is able to custom engineer not just a dust collector but the collection hoods for the scale hoppers, the bins and all the required ducting. In this application traveling dust hoods for the bins was designed. This has been a successful system and approach.